Paladin releases Chronically Metropolitan on August 4th, 2017. NYC MOVIE GURU: When it comes to finding the right balance between entertaining the audience and provoking them emotionally as well as intellectually, which of those 3 elements was most challenging to tweak in the editing room? Xavier Manrique: If you engage the audience emotionally, then they have more patience and want to see the rest of the journey. In the editing room, I find myself looking at what's going to grab the audience's attention the most. NYC MOVIE GURU: How important is it to have a likable character in a film? XM: Especially in the films that I like, you have to be rooting for a character. Maybe he's not likable, but you understand his point of view or what he's trying to do. I feel like it is important to have someone that is likable. 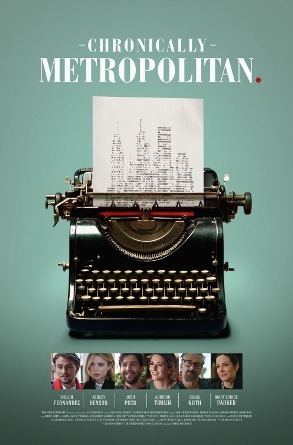 NYC MOVIE GURU: Would it be fair to lump Chronically Metropolitan into a genre? XM: It's not. You're right. It could be a drama, which it is, with humor. It's a coming-of-age film for a lot of people. So, I don't know if the film should have a certain genre to it because it can be everything. It's not a drama nor a comedy, so it might not be fair to call it one but not the other. NYC MOVIE GURU: Would it make a difference if someone watched Chronically Metropolitan while knowing the ending beforehand? XM: When it comes to the ending, some people see it coming and some people don't, but I feel like it's all about supporting the lead character and knowing that he paid for his mistakes. If you engage the audience with the character, then they'll be happy to stick through the film even if they know the outcome of the story. NYC MOVIE GURU: Is there some truth to cliches? What's wrong with using cliches? XM: Even starting with the film's title, "Chronically Metropolitan," you can automatically think that there's a cliche in the title: it's about an Upper Eastside family where the father is a literary lion and then there's the son who wants to emulate his father, but he hasn't gone through the same thing that his father has gone through. Just as the title is a cliche, it's also saying that it's a metropolitan city where these younger guys have access to a kind of culture with partying. This what makes the family uber-metropolitan given the situation that they're in. NYC MOVIE GURU: Is Fenton's father truly sorry when he apologizes? XM: I would say that he's truly sorry because he never thought that his life would cause so much trouble just like it did and he never expected when his wife picked up her stuff and left. I feel like he's really sorry at the end and doesn't want his kids to be alone like he is. NYC MOVIE GURU: DO you think Fenton will end up like his father when he's middle-aged? XM: I think he would be able to let go of Jessie at the end of the film because he realized that maybe he's idolizing his father for the wrong reasons. He realized that life isn't about writing and scaring everyone away from you. He really realized that he'd like to be a better person, out of his father's shadow, and a better writer while letting go of the girl who he wanted to get back into a relationship with. So, my interpretation is that he doesn't want to do the same things to his girlfriend that his father did to his mother. He has a chance to get back with her, but he lets her go so that she could be happy. NYC MOVIE GURU: Which other character from the universe of Dysfunctional Family movies would Fenton get along with? XM: He and Igby from Igby Goes Down because they walk around with self-entitlement. They both have to learn their lessons and have to lose a lot before they gain anything. That's what Fenton learns: nothing is given to you. Igby comes from the same demographic of people who haven't actually worked for anything. That's why they would be a good team. NYC MOVIE GURU: Would you want to live a life without any struggle? What's the purpose of struggle? XM: No, I would run away from that. When you struggle, you find ways to get better and improve. If everything is just given to you, then what's the point? By struggling, you appreciate more. NYC MOVIE GURU: A filmmaker once told me that a screenplay is so deceptive because you think that everything is all there, but it's really not. Do you agree with that in your case? XM: Yes. Editing the film was the biggest lesson I've learned about the writing of a screenplay and how, the next time I read a screenplay, I'll be looking for the stuff that has to be invented in the editing room. Even though this film had a good screenplay, you really don't know what you have until you try to piece it all together in the editing room. I feel like you learn more in the editing room with the material that you have. NYC MOVIE GURU: How tempting was it to go beyond the film's ideal running time of 90 minutes? XM: The temptation wasn't there because we shot this film in 18 days and then we had a few weeks to prep. The story is not an epic story, so there was no need to go over 90 minutes at all. NYC MOVIE GURU: If you had a larger budget like that of a tentpole movie, how would the film be different? XM: I'd spend more time with location scouting. I'd spend more time developing the story more. It's a human story, so it's more about human interactions, so I wouldn't go for anything with CGI. I'd spend more money getting a crane instead of shooting with a hand-held camera. NYC MOVIE GURU: Francois Truffaut once observed that a truly great film ought to have a perfect blend between Truth and Spectacle. Do you agree with that? XM: He's absolutely right. Having a balance between Spectacle and Truth. I'm part of the scool of humanism, and if you can convey it in a way with visually striking images that create a spectacle, then I think you have a perfect recipe for a successful film. NYC MOVIE GURU: Do you think it's harder to find Truth within Spectacle or Spectacle within Truth? XM: Truth within Spectacle because you can shoot something that's visually striking, but, after a while, there's no Truth behind it.